The most common (≥20% of patients) grade 1 or 2 adverse reactions in patients who received atezolizumab included fatigue (52%), decreased appetite (26%), nausea (25%), urinary tract infection (22%), pyrexia (21%), and constipation (21%).11 The most common (≥2% of patients) grade 3 or 4 adverse reactions in patients who received atezolizumab included nausea (2%), abdominal pain (4%), fatigue (6%), urinary tract infection (9%), back or neck pain (2%), hematuria (3%), and dyspnea (4%). 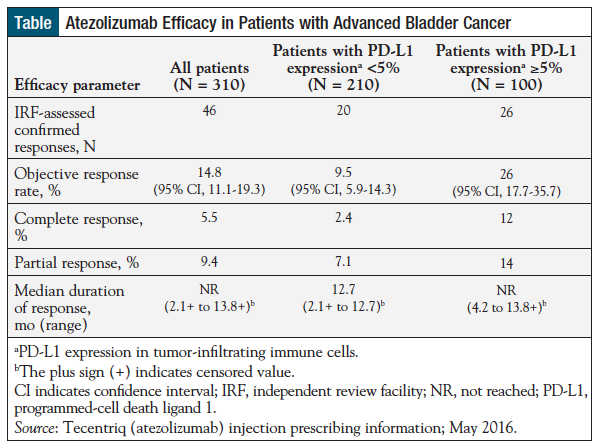 Atezolizumab is the first PD-L1 inhibitor approved by the FDA for the treatment of patients with locally advanced or metastatic urothelial cancer that progressed after a platinum-containing regimen in the neoadjuvant, adjuvant, or advanced-disease setting. Atezolizumab demonstrated high response rates and durable responses, with a median duration of response not yet reached after approximately 14 months of follow-up. Loehrer PJ, Einhorn LH, Elson PJ, et al. A randomized comparison of cisplatin alone or in combination with methotrexate, vinblastine, and doxorubicin in patients with metastatic urothelial carcinoma: a cooperative group study. J Clin Oncol. 1992;10:1066-1073.